This title offers a fiery and exotic cuisine: the traditions, techniques, ingredients and recipes. It is a complete guide to one of the world's most popular cuisines: the ingredients, the techniques and the recipes, shown in over 700 specially-commissioned colour photographs. Explore the traditions and history of this fascinating country and discover how the cuisine has evolved over the years. It is a fully illustrated reference section explains all the key Thai ingredients, together with useful step-by-step information on how to prepare and cook them. It includes advice on using special equipment, from firepots to cleavers. It includes easy to use chapters that cover every occasion for serving Thai food: including appetizers, soups, salads, poultry, vegetables and fish dishes, as well as desserts. It includes 180 fabulous recipes, from classic Thai Fish Cakes and Red Chicken Curry to Scented Fish Salad, and Duck and Sesame Stir-Fry. 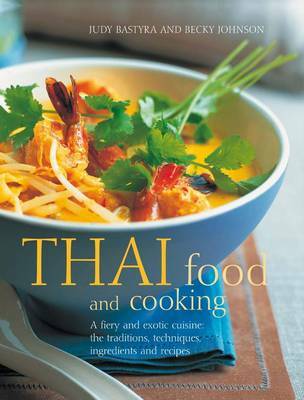 This is an essential guide for all lovers of Thai food, suitable for cooks of any level of experience and expertise. Thai cuisine is one of the most popular ways of eating. This fabulous book has 180 wonderful, fragrant recipes to try out. It includes fascinating information about the history and traditions of this rich culture. There is a fully illustrated guide to Thai ingredients, with preparation and cooking techniques to ensure you have all the basics. The recipe collection brings together classic and modern dishes such as Green Curry Puffs and Salmon Marinated with Thai Spices, and for dessert dishes such as Mangoes with Sweet Sticky Rice, and Coconut and Lemon Grass Ice Cream. This is a book to be treasured by all lovers of aromatic and flavourful food.